Thousands of children's and youth leaders use ROOTS Children & Young People resources each week. Could ROOTS inspire you too? How will ROOTS help your group encounter and explore the Bible? Each week, ROOTS offers ways for children and young people to get to know and think about one of the readings from the Revised Common Lectionary – and to explore how it relates to their everyday lives. 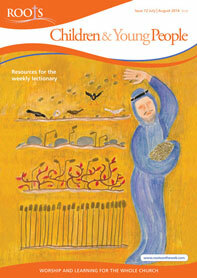 For weeks when the Church of England’s Common Worship Lectionary differs, we provide materials online. The Adult & All Age resources focus on the same reading as Children & Young People, so that the children can learn from the same Bible passage as the adults. In both the magazine and online, we offer a dedicated young people section - helping you to put together a truly creative, engaging and thought-provoking session for young people.